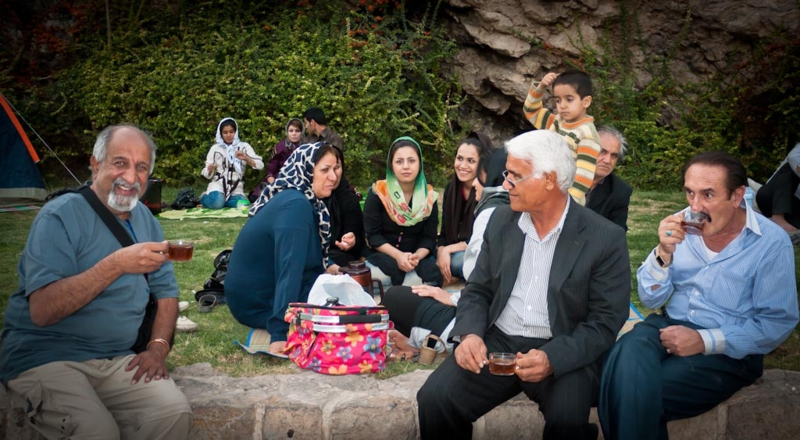 Summary: There are no words to describe the hospitality, kindness, love and gentleness of the Iranian people. We have ventured into over forty countries, but never have we experienced such generosity. 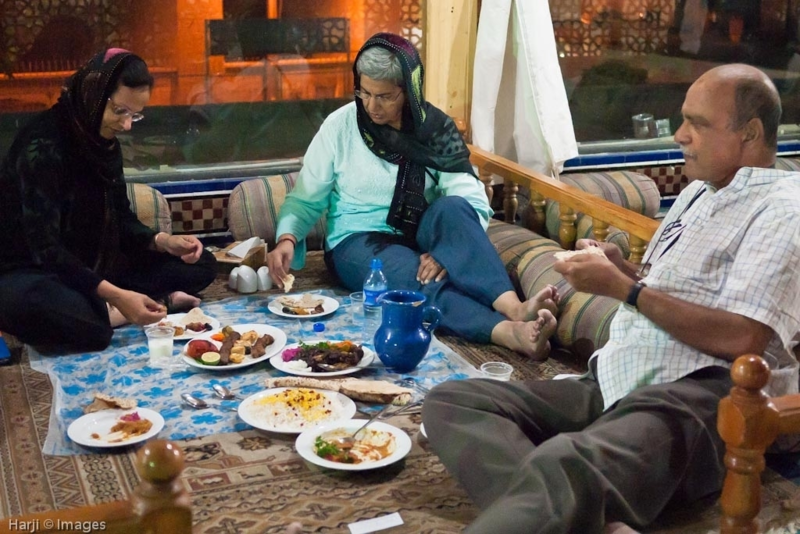 Our bodies may be back in Montreal, but Iranian hospitality has stolen our hearts which are probably somewhere either in Esfahan or Shiraz. When we arrived in Tehran we found it to be a bustling, fast moving city with a population of 16 million people, and with the craziest drivers in the world. After a few days in Tehran, we ventured up North into the Alborz Mountain range to the quaint village of Ghazor Khan, the base of the historic Alamut Castle. 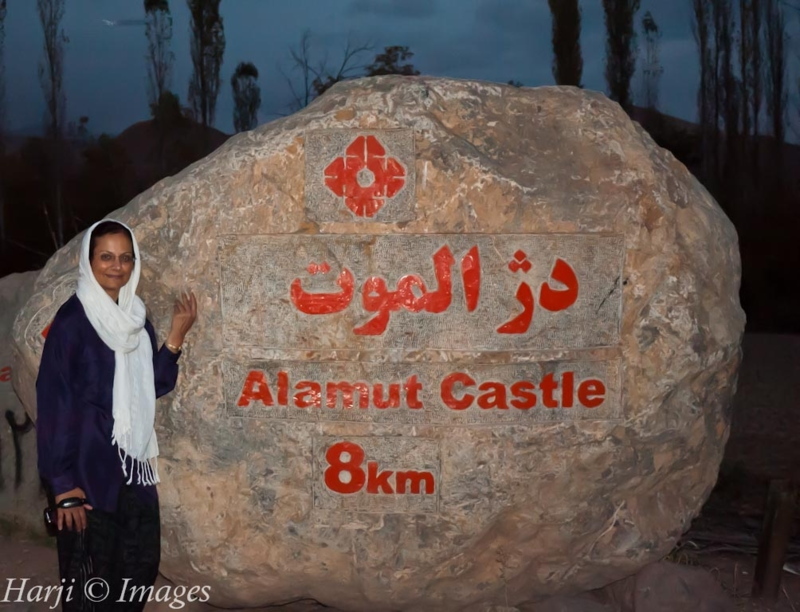 The next morning we trekked up to Alamut Castle – quite an uphill hike! From Alamut, we bussed back to Esfahan via Tehran. Naqshe-e-Jahan, the heart of Esfahan, is surrounded by the Char Baghs and is one of the most wonderful sights we have ever seen. No words can describe this heaven on earth. 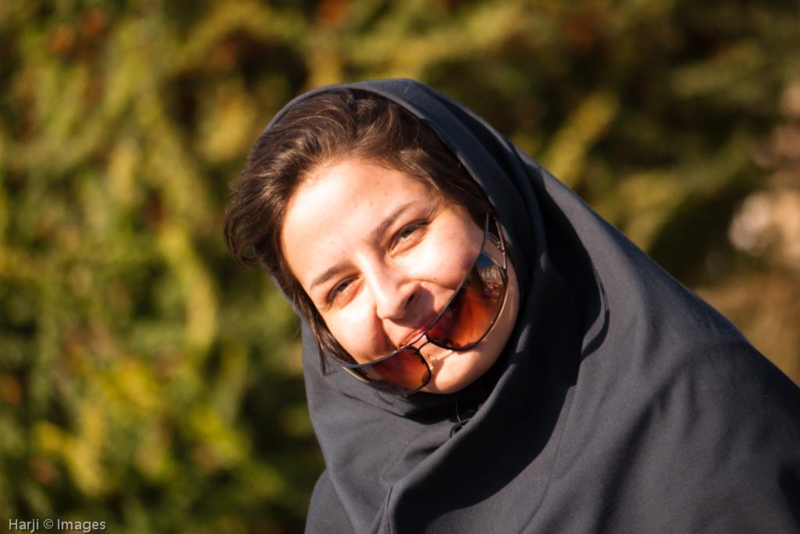 From there, we crossed through Southern Iran to Shiraz via Yazd, Chak Chak, and Persopolis, and after just about a month on the road, took a flight home in early November. A statue of the Iranian poet Hafiz, who was born in Shiraz in 1315 and died there in 1390. 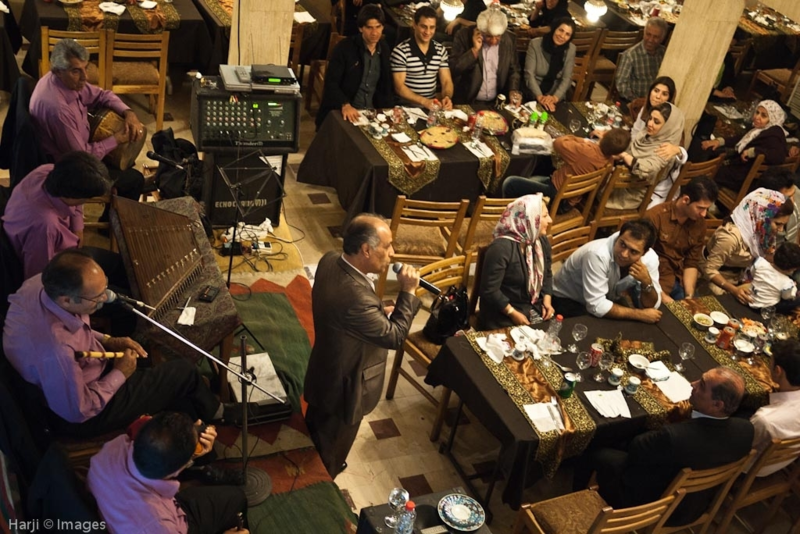 He is a beloved figure of the Iranian people, who learn his verses by heart. Photo: Muslim Harji, Montreal, PQ, Canada. © Copyright. Mausoleum of Hafiz in Shiraz, Iran. Photo: Muslim Harji, Montreal, PQ, Canada. © Copyright. The Canopy with intricate design and verses of Qur’an over Hafiz’s Tomb. Shiraz, Iran. Photo: Muslim Harji, Montreal, PQ, Canada. © Copyright. Darvaze-Qur’an or the Qur’an gate , in Shiraz, Iran, is an ark shaped monument near Qur’an Square. 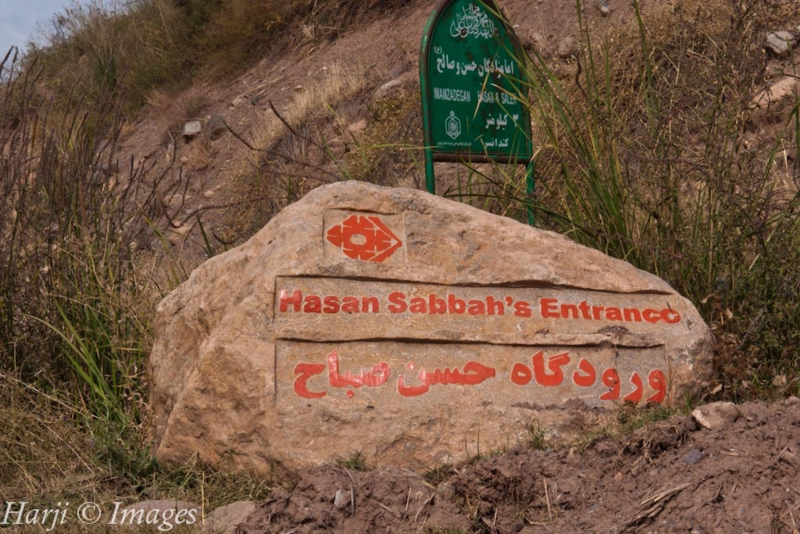 It used to be on Shiraz-Esfahan road at the far northeast of the city. A hand written Qur’an was placed at the top chamber of the arc, so that the passengers who were leaving the city or entering, would pass under the Qur’an for good luck, blessings and safety on their travels. Photo: Muslim Harji, Montreal, PQ, Canada. © Copyright. Nasr al-Mulk Mosque, Shiraz, Iran. Photo: Muslim Harji, Montreal, PQ, Canada. © Copyright. The interior pf the Nasr al-Mulk Mosque, Shiraz, Iran. The mosque extensively uses colored glass in its facade, and displays other traditional elements such as panj k seh-i (five concaves) in its design. Photo: Muslim Harji, Montreal, PQ, Canada. © Copyright. Kharanaq is an ancient mud-brick village, continuously inhabited for over 4000 years. It is in the middle of two deserts and surrounded by beautiful mountains. Parts of the village are over 1000 years old. Only a few families live there now as most of them have moved to the more comfortable and modern parts of the village. Photo: Muslim Harji, Montreal, PQ, Canada. © Copyright. The Music Room at Alighapoo Palace. Situated on the sixth floor, there are deep curvy niches cut on the walls in form of shelves which account for the pleasing sound effects in the room. This room is also tastefully decorated, but the acoustic quality of the room is its main attraction. All carvings are done in forms of various musical instruments of the time. Carvings in the Roof of the music room at the Alighapoo Palace was designed in a way that two musicians created enough echo for impression of a full orchestra. Photo: Muslim Harji, Montreal, PQ, Canada. © Copyright. Built during the Safavid period in the 17th century, this mosque represents the finest in Islamic Architecture of Iran. The Shah Mosque of Esfahan, named as the Imam Mosque once Ayatollah Khomeini became Iran’s Supreme Leader following the disposal of the Shah in 1979, is registered along with the Naghsh-i Jahan Square (below) as a UNESCO World Heritage Site. Its construction began in 1611, and its splendor lies in the beauty of its seven-colour mosaic tiles and calligraphic inscriptions. Photo: Muslim Harji, Montreal, PQ, Canada. © Copyright. Naghsh-i Jahan Square with calligraphy at its finest, which include the Names of Allah, the Prophet Muhammad, and Hazrat Ali as well as Qur’anic Ayats. Photo: Muslim Harji, Montreal, PQ, Canada. © Copyright. The magnificent dome of the Sheikh Lotfollah Mosque, which is referred by different names such as ‘the mosque with the great dome’ and ‘the mosque of great purity and beauty’. The pale tiles of the dome change color, from cream through to pink, depending on the light conditions. It is one of the architectural masterpieces of Safavid Iranian architecture, standing on the eastern side of Naghsh-i Jahan Square, Isfahan, Iran. Construction of the mosque started in 1603 and was finished in 1618. Photo: Muslim Harji, Montreal, PQ, Canada. © Copyright. 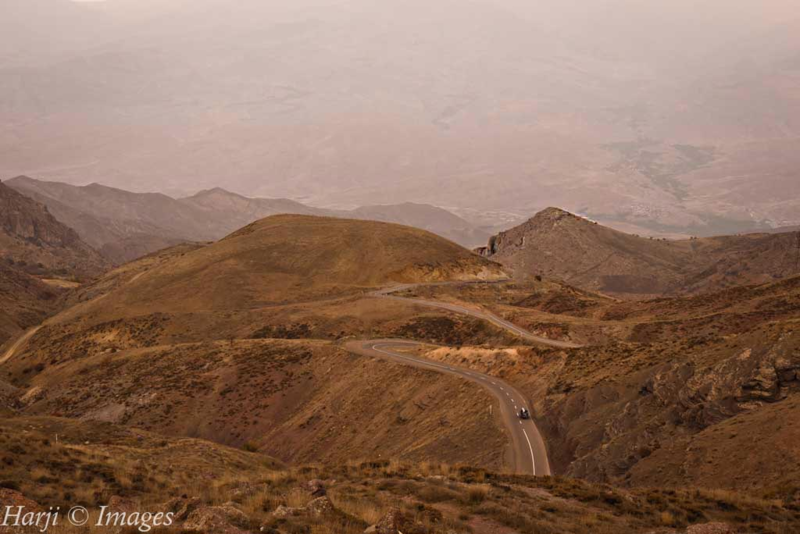 The twisting road crossing three mountain ranges that brings visitors to Alamut. Photo: Muslim Harji, Montreal, PQ, Canada. © Copyright. 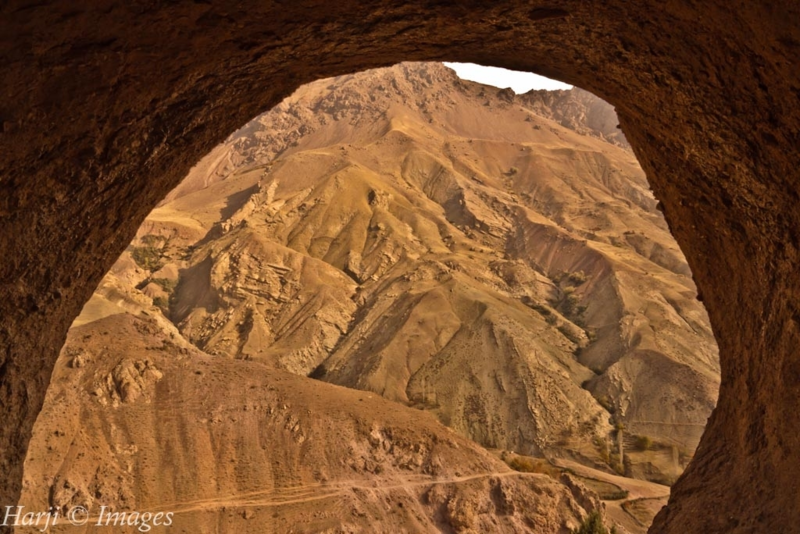 Alamut lies at the end of a tortured, winding road that twists and turns over three mountain ridges, countless valleys and across some of the wildest and most spectacular scenery in all Iran. No one comes here by accident. The 80kms journey from Qazvin takes some three hours of hard driving on a modern road that is only a few decades old. Before that, all that existed was a narrow donkey track to lead the traveller to his destination, a journey that could last days, and sometimes weeks. At the foot of the mountain on its western side lies the little village of Ghazor Khan, nestled among orchards of pretty cherry trees. From this position, the rock appears as a slim, rugged pyramid. It is not until you come to the foot of this colossal mass of granite that you realize the immensity and impregnability of the fortress at its summit.Photo: Muslim Harji, Montreal, PQ, Canada. © Copyright. 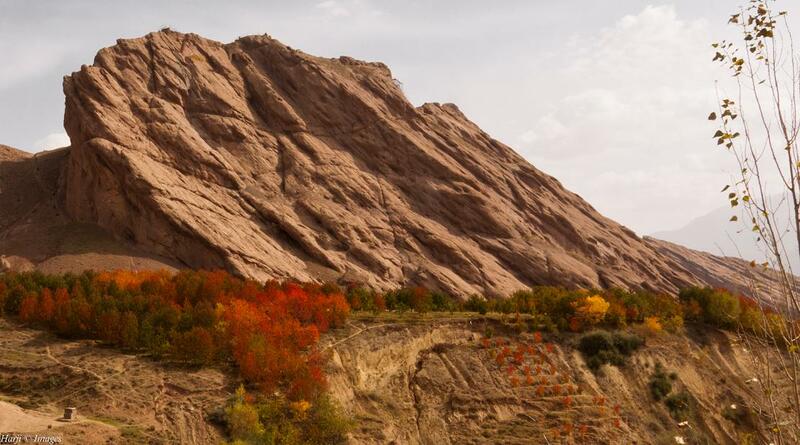 Bigger than anything else in the world it seems, the rock of Alamut is deeply scarred by grooves and curious striations that change colour with the quality of the light: now purple, now mauve, metallic grey, brown. You could almost believe this mass of rock was breathing like an immense, sleeping organism. Local village boys offer donkey rides up part of the track, but the Harjis declined the offer. Photo: Muslim Harji, Montreal, PQ, Canada. © Copyright. The hills around the fortress are folded in delicate shades of pastel green or lavender, pinkish in some places, terra cotta in others. Ochres and browns are streaked in wide brush strokes across the landscape. It is a truly beautiful place. The last part of the climb is a hair-raising assault up a vertical cliff face covered in scaffolding and wooden planks as a result of excavation work that has been underway for some time. 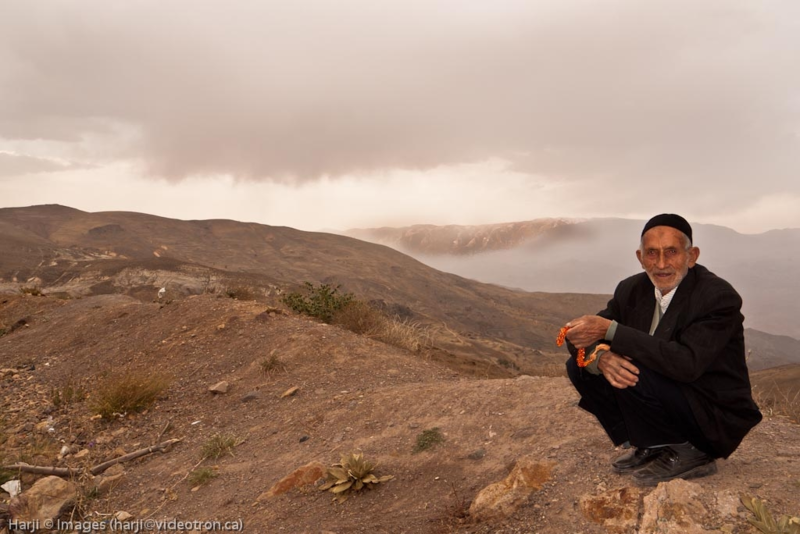 Photo: Muslim Harji, Montreal, PQ, Canada. © Copyright. 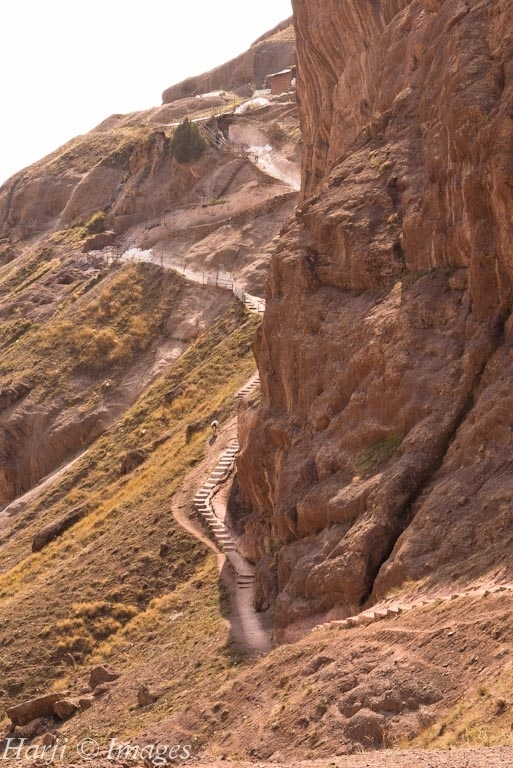 Under the leadership of Hasan bin Sabbah, Alamut became the site of intense activity for the Shia Nizari Ismaili Muslims between 1090 and 1256 AC. 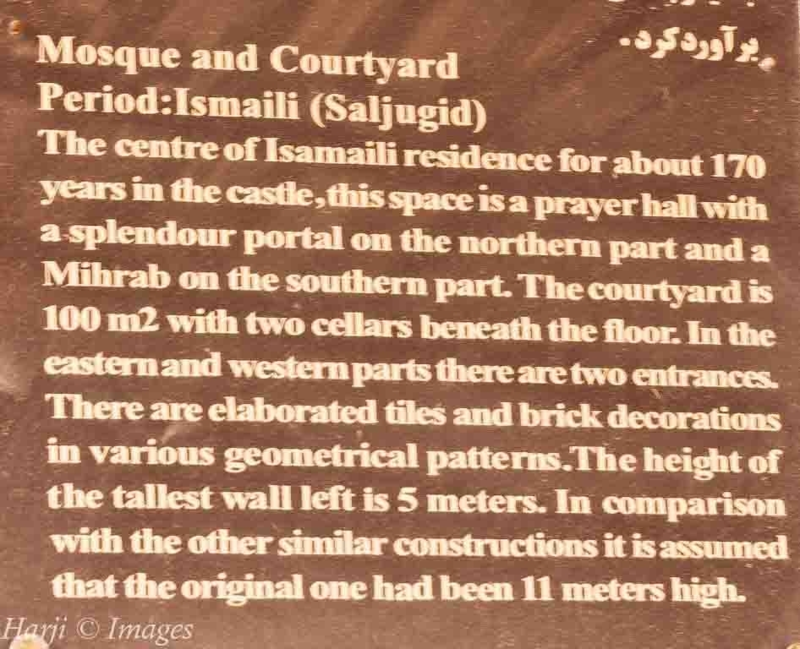 During the medieval period, the castle functioned as the major stronghold of the Ismaili state. 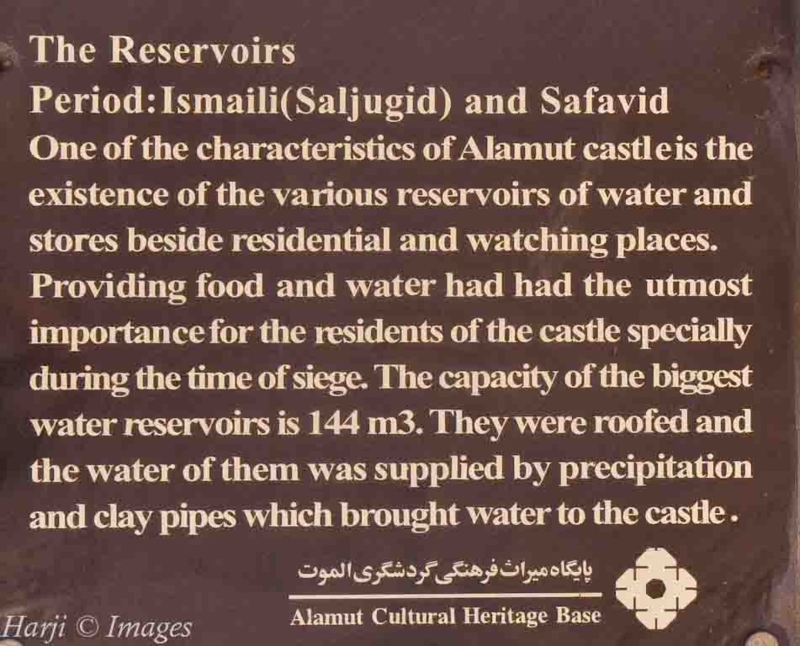 In 1256, Ismaili control of the fortress was lost to the invading Mongols and its famous library holdings were destroyed when the castle’s library was condemned to be burned by Ata-Malik Juwayni, a servant of the Mongol court. 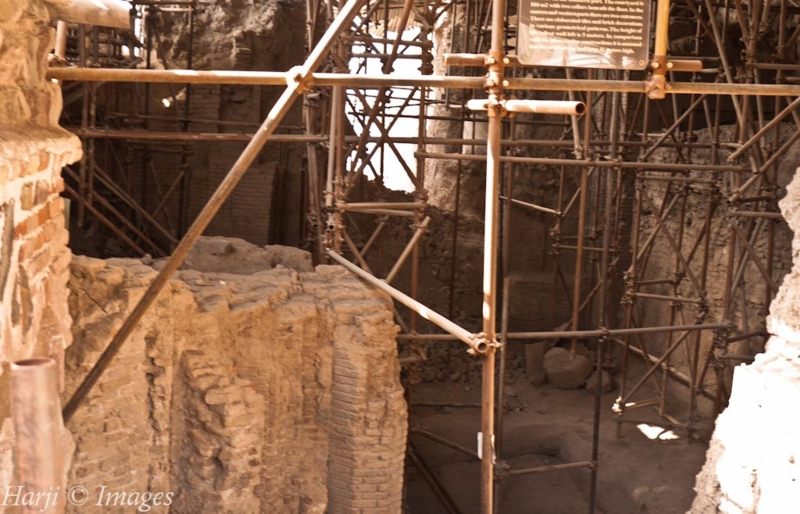 Recent archeological excavations at Iran’s Alamut fortress have yielded food storage rooms and water reservoirs in the northwestern historical site as well as a prayer hall. The legendary water basin which filled itself up by collecting rainwater and melting snow from channels and canals on the mountains. Photo: Muslim Harji, Montreal, PQ, Canada. © Copyright. 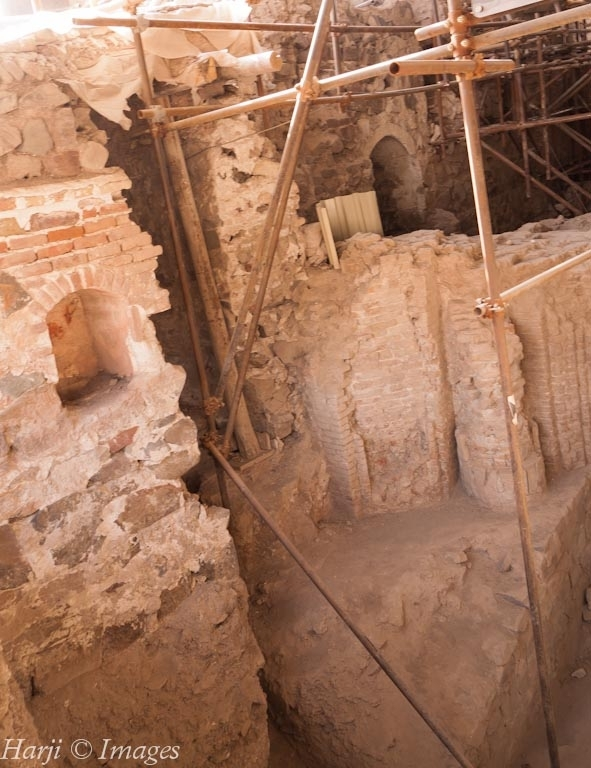 In one of the rooms at Alamut, can be seen the legendary water basin which filled itself up by collecting rainwater and melting snow from channels and canals on the mountains. It was famed never to overflow. Other rooms were clearly intended for storage, perhaps once filled with barley, honey, oil, dried fruit and sheep fat to enable the citadel to hold out during a siege for years if need be. Legend has it that during the castle’s conquest and destruction by the Mongols, an invading soldier is reported to have fallen into one of these tanks and drowned in a vat of honey! 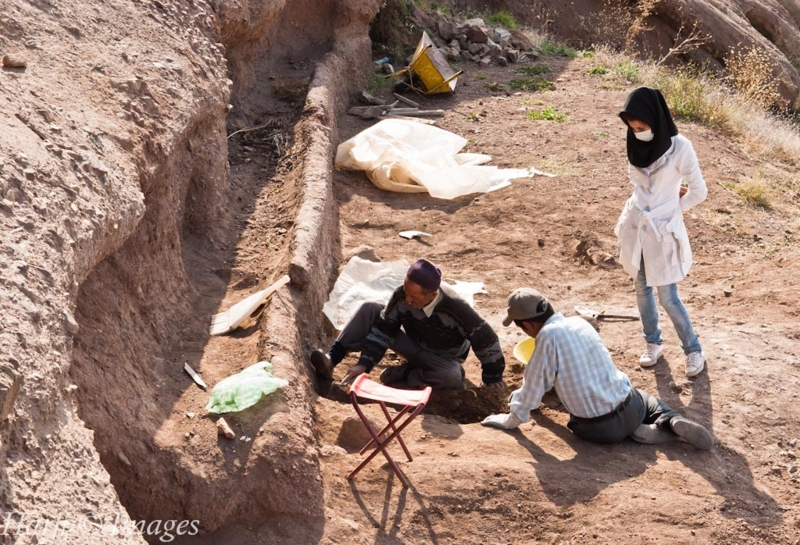 Today, Alamut is being carefully excavated under the watchful eyes of experts. 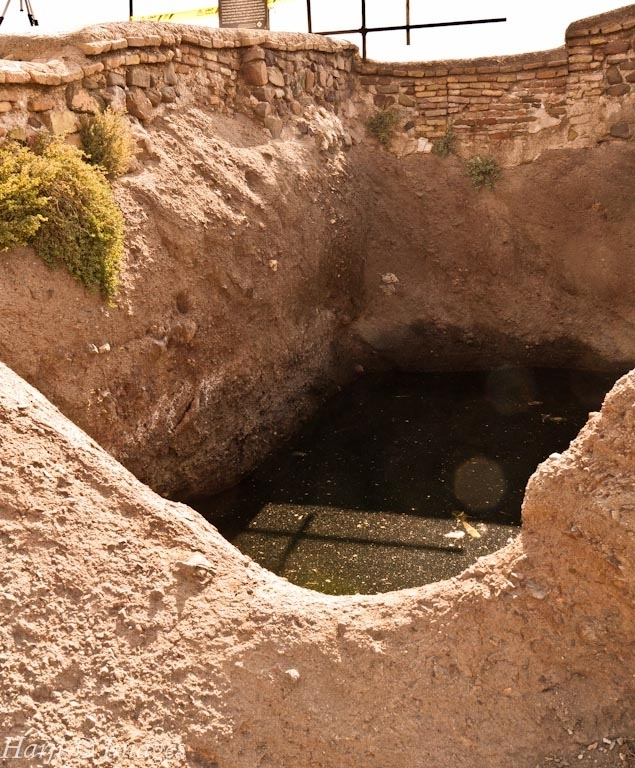 The eleventh season of archaeological excavations in the Alamut Castle for removing the detritions of tank water that is located northwest of the Cape began a few months ago. Iran is full of rich culture and history with contributions in all facets of human progress and endeavour – in science, math, logic, poetry, engineering; the people of Iran have a love for nature; parks and gardens abound, and families picnic in the parks; the Iranian people have a love of humanity – they are outgoing, friendly, generous to each other as well as to visitors; they are also deeply passionate with deep running emotions, they are fun loving and full of spirit; everyone recites and writes poetry. 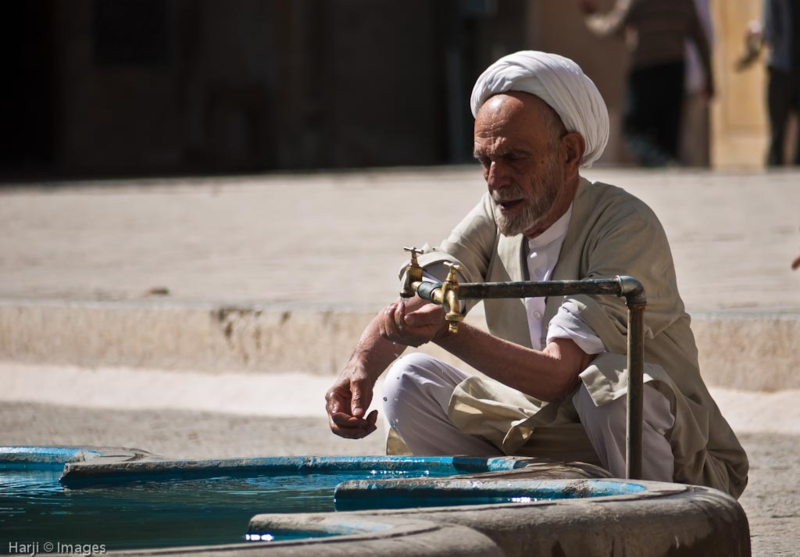 Ablution before prayers at the Jummah Mosque, Shiraz. Photo: Muslim Harji, Montreal, PQ, Canada. © Copyright. Nevin Harji with a group of Iranian High school students and their teacher visiting the Imam Mosque (Masjid-e Jam ‘e Abbasi) in Esfahan. Photo: Muslim Harji, Montreal, PQ, Canada. © Copyright. 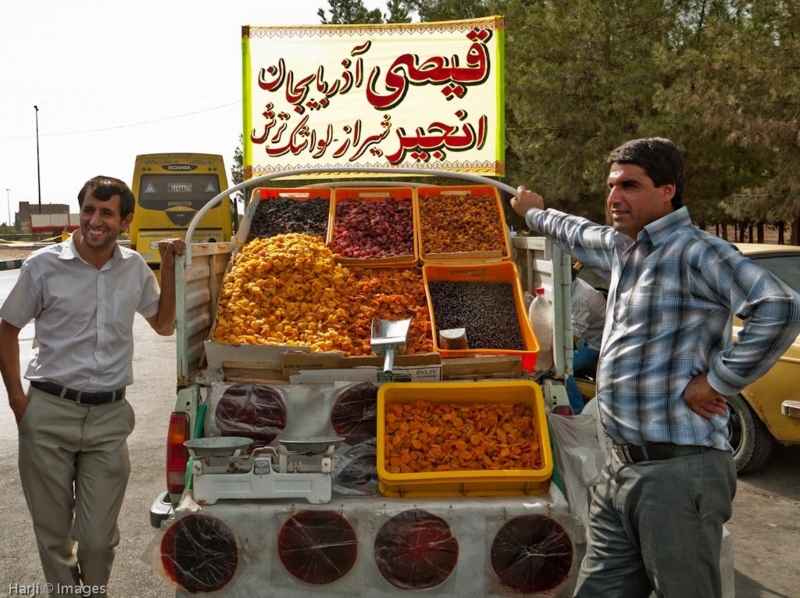 As a general description, food in Iran tends to be colorful, healthy and simple. Taste is added via herbs, light spices and fruit and the resulting dishes are mild as opposed to spicy. 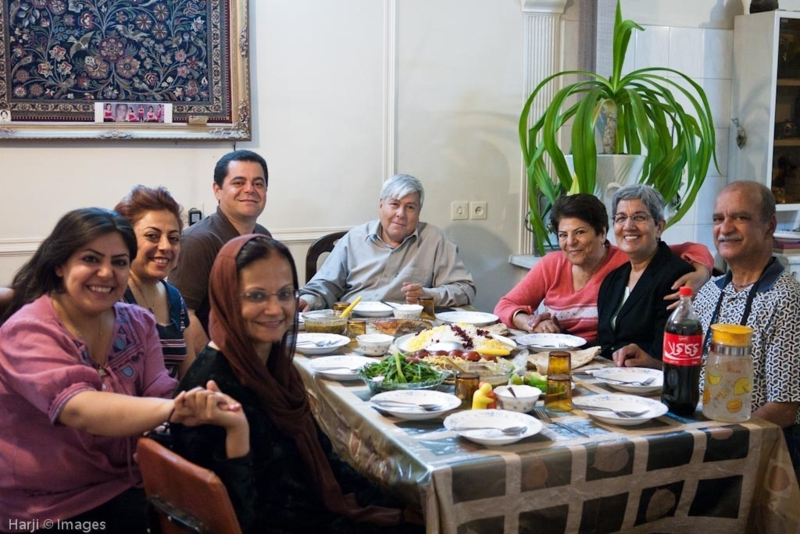 To taste true Iranian food, it is necessary to eat at an Iranian’s home. 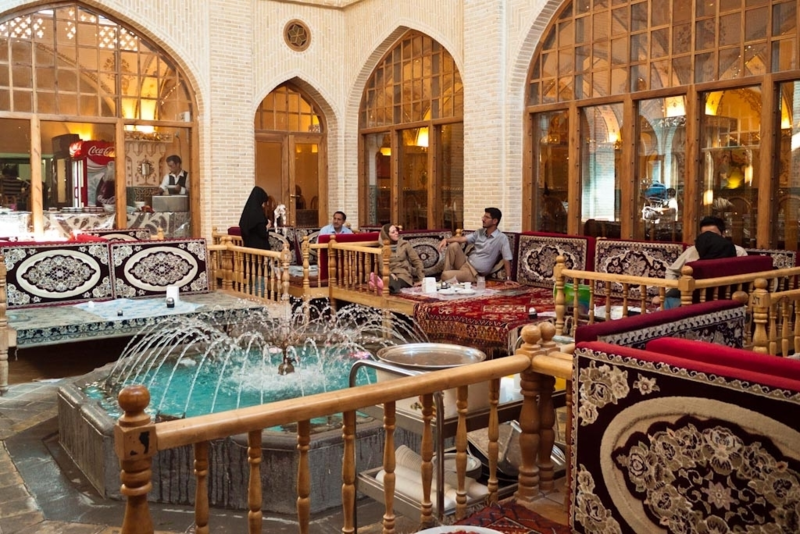 Most restaurants in Iran limit the food they sell to different types of kebabs and there is, therefore, very little variety. Nan Sangak (stone bread), is the most famous and most delicious Iranian bread. Nan Sangak is baked over hot small pieces of rocks/stones. Photo: Photo: Muslim Harji, Montreal, PQ, Canada. © Copyright. Nan Sangak (stone bread), is the most famous and most delicious Iranian bread. Nan Sangak is baked over hot small pieces of rocks/stones. Nan or Noun in Persian language means bread, and Sang means rock or stone. Iranians eat most of their traditional foods with Nan Sangak. Iranians love Nan Sangak for breakfast, lunch and dinner! 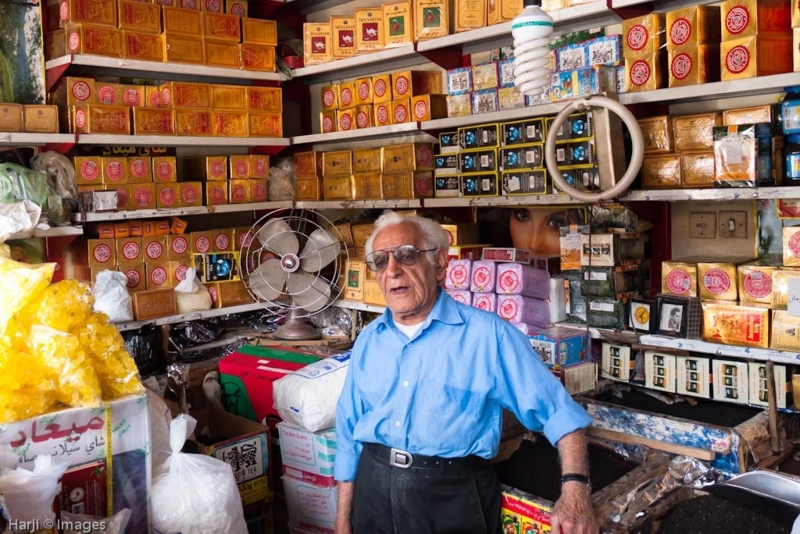 There are Nan Sangak bakeries in every corner of every street, thus Iranians rarely make nans at home. One of the distinctions of the Iranian cuisine is the subtlety of the seasonings, which limits the use of garlic so as not to offend others. Onions and garlic are used only with discretion, but cinnamon, cloves, cardamom, saffron, paprika, nutmeg, turmeric and dill are used with artistry: never overpowering, always gently enhancing the main ingredients. 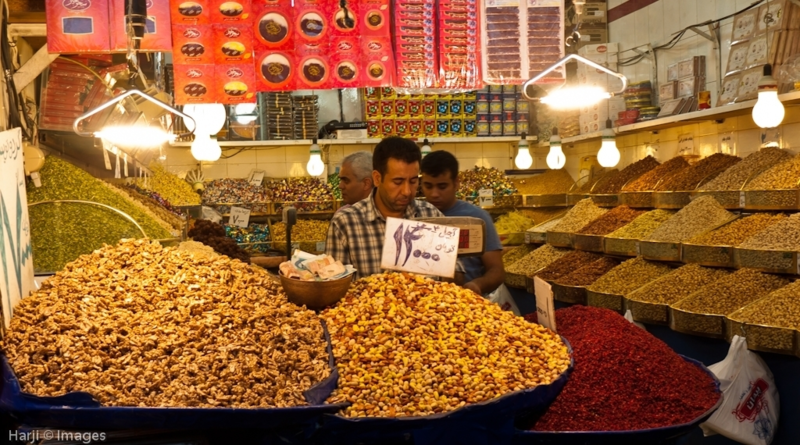 To balance the natural sweetness of fresh and dried fruits used so often in cooking, the Iranian cook adds judicious amounts of tartness by using one of the following: VERJUICE, the sour juice of unripe grapes, lemon or lime juice, strips of dried limes, dried tangerine peel or tamarind. Powdered SUMAC, with its chili-powder appearance and sour taste, is a seasoning often used for broiled meats. Pomegranate juice and seeds are often used both for color and tartness. 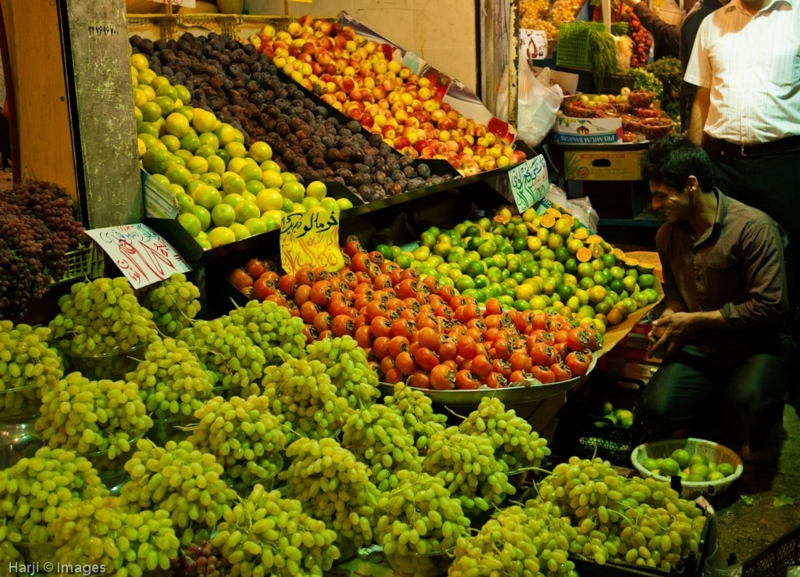 The climate of the Middle East is conducive to growing fruits, and the orchards and vineyards of Iran produce fruits of legendary flavor and size. These are not only enjoyed fresh and ripe as desserts, but are also imaginatively combined with meats and form unusual accompaniments to main dishes. 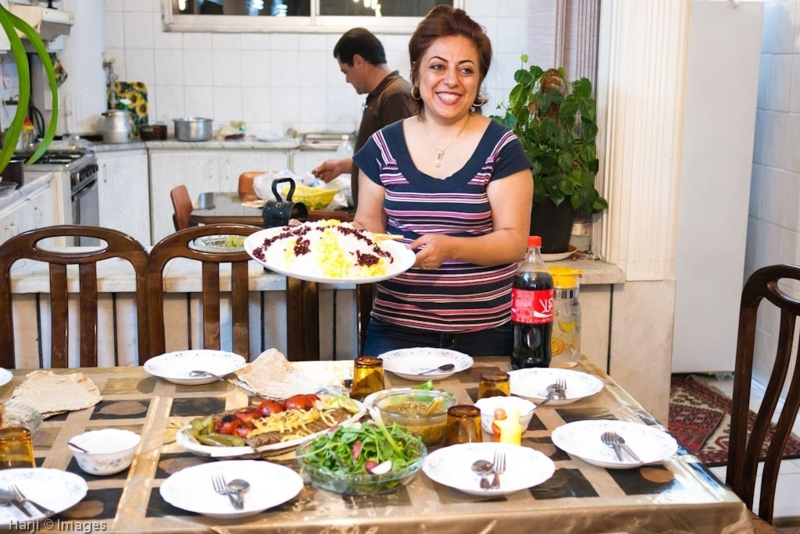 While the eggplant is the “potato of Iran,” Iranians are fond of fresh green salads dressed with olive oil, lemon juice, salt and pepper and a little garlic. Vegetables such as pumpkins, spinach, string beans, varieties of squashes and carrots are commonly used in rice and meat dishes. Dizi, or Ab-Goosht, is one of the most traditional Iranian food, that is eaten with Nan Sangak. Goosht in Persian language means meat, and Ab means water, so Ab-Goosht means water and meat. 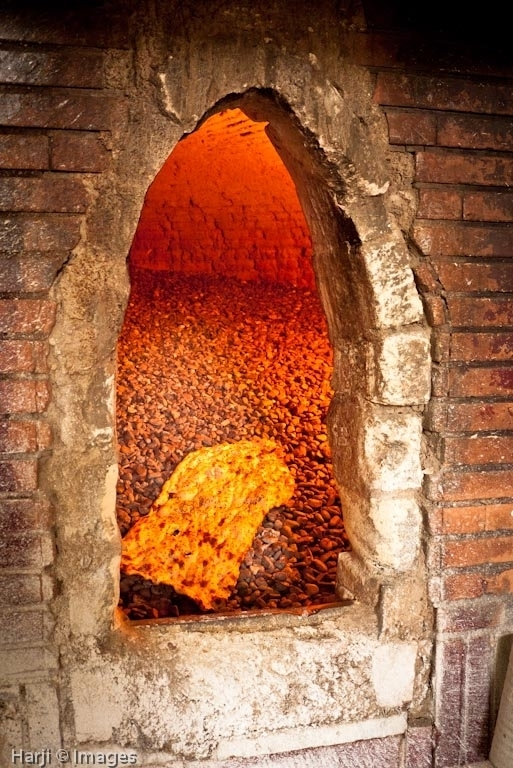 It is cooked mainly by boiling beans and legumes, meat, potato, tomato, onion, and a lot of water. 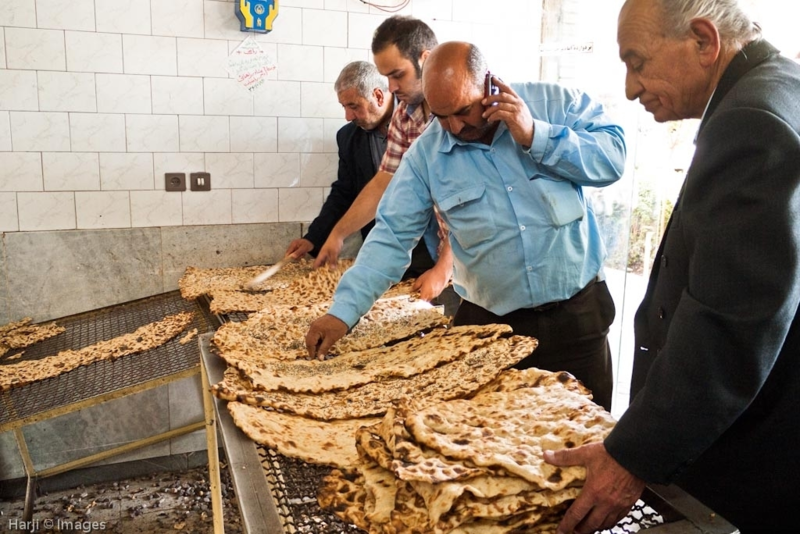 Eating Dizi has its own tradition and techniques! You must soak your nan in the sauce of dizi and enjoy it with soft-boiled meat and vegetables on the side. 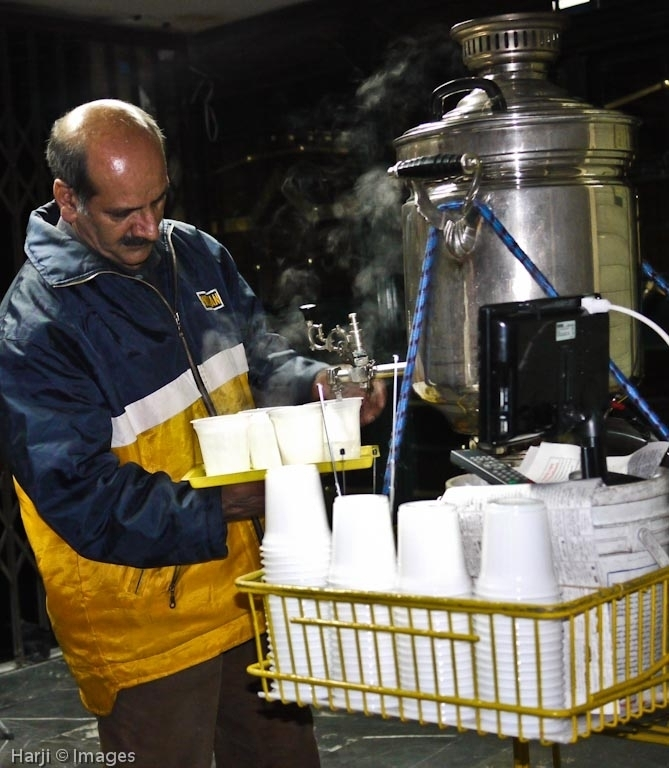 The national beverage of Iran is sweet, clear tea, often sipped through a sugar cube. Sweet tea starts the day, breaks the work hours, may accompany social or business engagements and sometimes meals. Muslim Harji and friends savouring Agha’s hospitality. 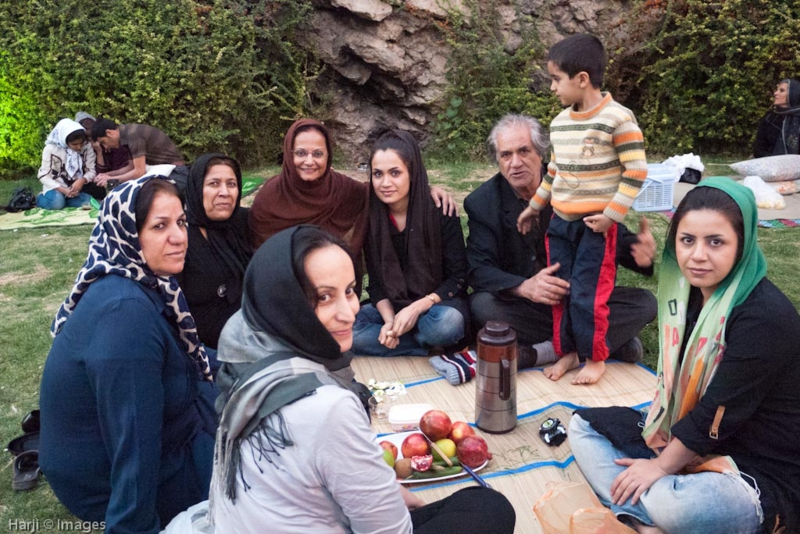 Sharing a cup of chai with Agha’s family on a Jummah picnic, Darvaz-e-Quran Park, Shiraz. Photo: Muslim Harji, Montreal, PQ, Canada. © Copyright. Date Updated: November 17, 2014. Profile of Muslim and Nevin Harji at Contributors. Subscribe at top right of this page to receive new post notifications. We welcome feedback from our readers. Your feedback may be edited for length and brevity, and is subject to moderation. We are unable to acknowledge unpublished letters. Thank you and I am proud to be Iranian and an Ismaili. 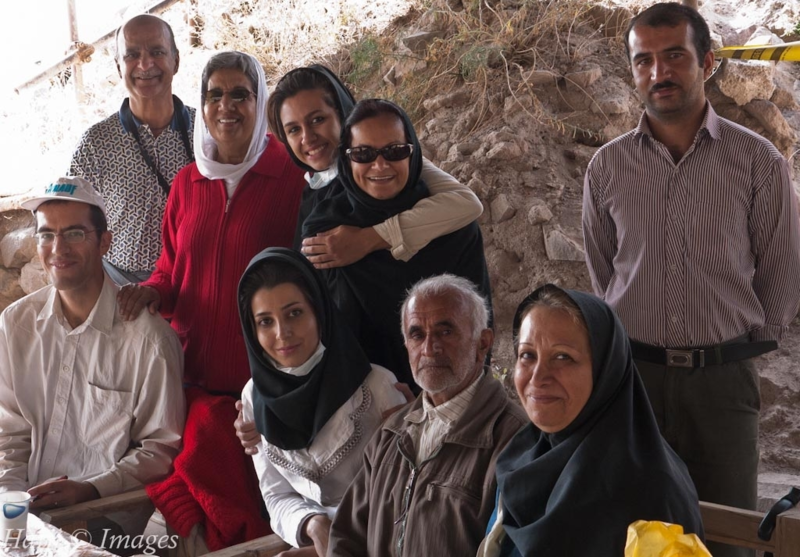 Perhaps you can help young Ismaili Iranians – many have good high education but no jobs! Thank you Muslim/Nevin Harji for this article and magnificent photos. We can say, one picture is better than thousands of words. Been there and seen this great country that awaits to be discovered by many. Great friendly people of Iran can’t wait to talk to you and have photo with you. The history, the museums, the topography and monuments await you. Muslim you chose to pass the ‘mule ride to partway Alamut climb. I took it and what a ride it was! 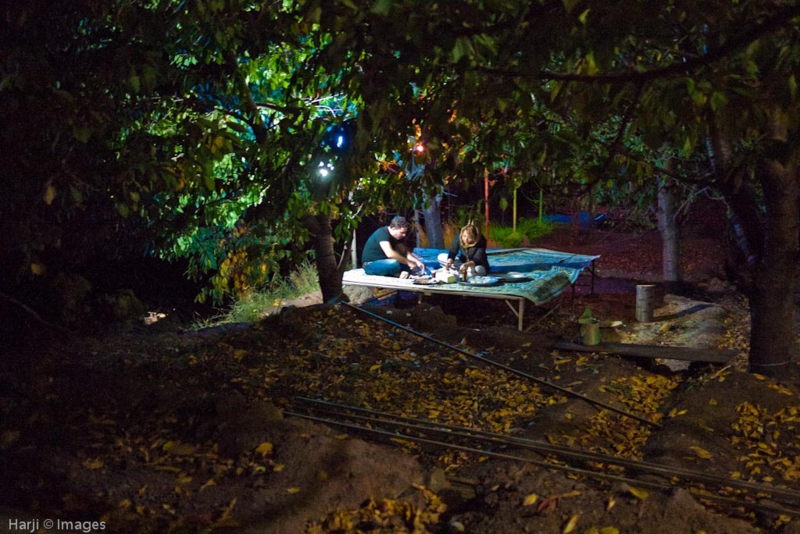 Through your lens, you have captured Iran well. An experience of a lifetime. 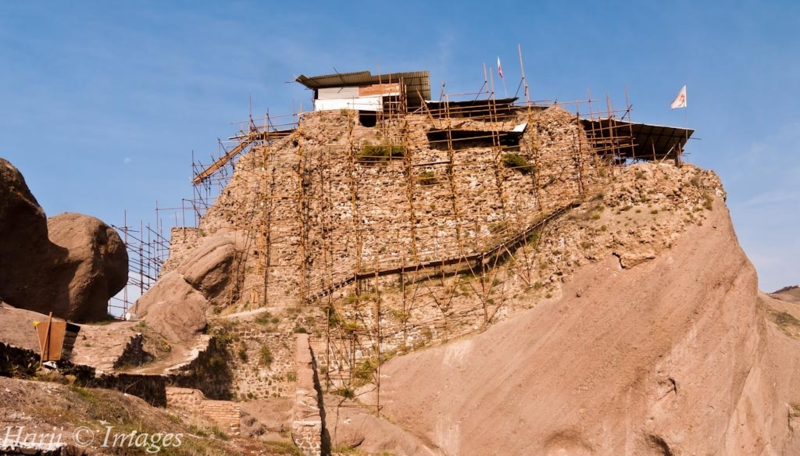 A very interesting piece of our past Alamut empire, and the people and monuments in that area. A great way to teach a history lesson to everyone. Congratulations to the Harjis for a job well done. 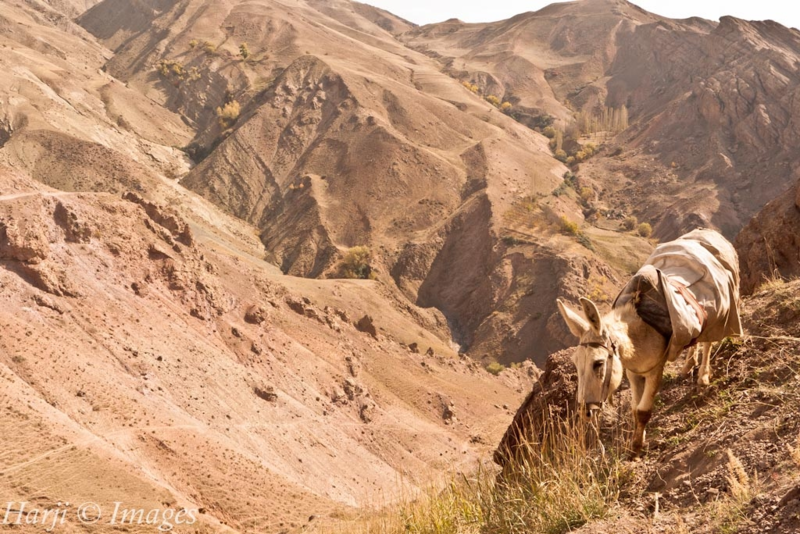 What a magnificent article about Alamut! Many thanks to the Harjis.